Announced in 2013, the AMBER enabled the operation of Europe’s first green flights for turboprop aircraft. AMBER has laid a solid foundation to establish new arrival procedures for Riga Airport that will shorten the distances flown, improve flight trajectories to avoid residential areas and reduce people’s exposure to noise, as well as cut fuel consumption and emissions. 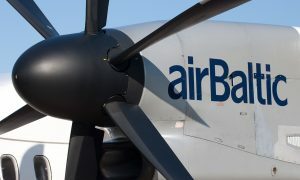 The project introduced satellite-based approach procedures at Riga Airport for airBaltic’s state-of-the art Bombardier Q400 Next Gen turboprop aircraft and thus helped to practice greener flying. The main objective of the AMBER (Arrival Modernization for Better Efficiency in Riga) project was to introduce new arrival procedures at Riga International Airport, to reduce CO2 emissions and noise levels at the airport and close vicinity, especially the touristic Jurmala area located on the coastline of Latvia, north west of the airport. The new trajectory is up to 30 nautical miles shorter towards runway than what was being flown previously, and enables reducing CO2 emissions by up to 300 kg on every Q400 flight. 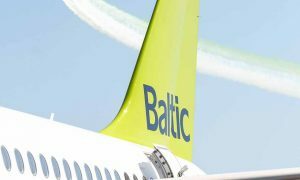 When rolled out to its full scale, the green flying will reduce CO2 emissions by 5.000.000 kilograms annually for airBaltic. 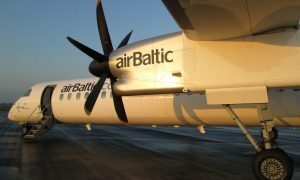 “The new green procedures that have been established and flown with our Bombardier Q400 Next Gen turboprops will be available to any airline flying to Riga with the relevant aircraft equipment. The procedures will also be suitable for our brand new Bombardier CSeries jets, which will be introduced into service in 2015, and will provide further benefits for operations out of Riga, on top of their unmatched fuel efficiency”, states Capt. Pauls Calitis, Vice President Flight Operations of airBaltic. The AMBER project is implemented by airBaltic in partnership with Airbus ProSky subsidiary specialized in modern flight operations solutions and Latvia’s Air Navigation Service Provider LGS and sponsored by SESAR, the air traffic management research programme of the Singe European Sky. With this project, SESAR will be able to demonstrate that the entire commercial aviation community, including regional aircraft, can change and reduce its impact on the environment.